Yesterday I attended my second cake decorating course - more on that later. Last night I finished a jigsaw puzzle, thus crossing another item off my 101 Things list. Right now I'm ridiculously excited about the season premiere of Downton Abbey, which seems like a nice finish to a day that included a cheese making course (will post on that once I've sampled said cheese), also for my 101 Things list, and a day that involved fancy-pants pizza for dinner. I consider any pizza that doesn't use standard grated mozzarella or tasty cheese and has at least one slightly unusual ingredient to be fancy-pants. Said pizza is often found on a thin crust to allow the flavours to shine, which I certainly achieved in this case on account of using mountain bread (and gluten free wraps for mum) as a base. 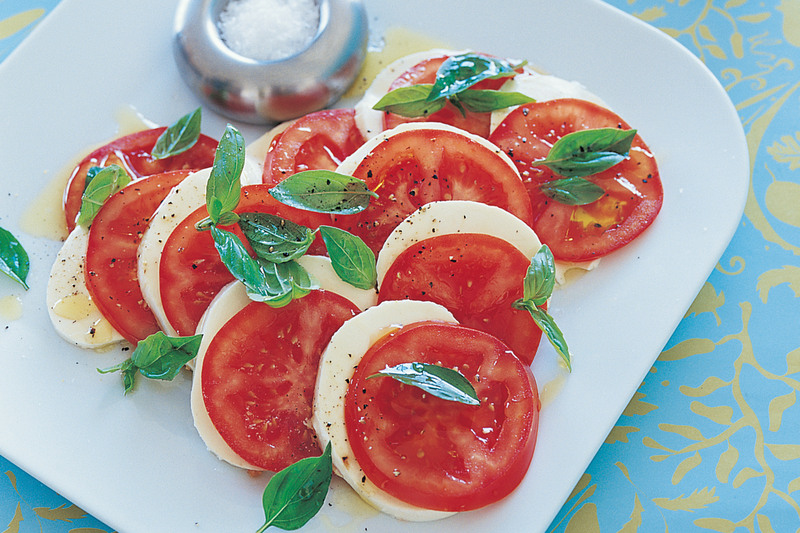 Have we all encountered Caprese salad? I'm actually sort of devastated to realise that I didn't invent the pizza version myself because, until I Googled this image just now and came up with a million pizza recipes, I sort of thought I had. Damnit! They're dead easy to make, though. Preheat oven to 220oC. Line baking tray with foil. Smear the basil paste on the mountain bread. Arrange the tomato and bocconcini alternately on pizza, with one slice of tomato in the middle, and each slice topped with bocconcini. Drizzle very lightly with balsamic vinegar. Bake 10-15 minutes, until cheese melted and bread crisps. Note that using single-thickness GF wraps will mean it is problematic to remove the pizza from the tray, as the balsamic soaks through. I first encountered this flavour sensation up in my beloved High Country, when I was staying at Falls Creek for some field work with awesome alpine ecologists Suz and Sera, who both happened to be vegetarian. Sera whipped this beauty up one night (using plain store-bought pizza bases to make them more filling) and I haven't looked back. Fry onion until softened but not brown, then add brown sugar and a little water and cook until bubbles and caramelises (you may need to add a little water. Keep stirring so it doesn't turn to glue!). Spread onion mixture on pizza base. Arrange pumpkin on pizza base. Crumble 1/3 of the feta over it. Bake approx. 10 minutes until base starts to crisp and cheese is soft. Remove from oven and spread with baby spinach and crumble remaining feta over it. Bake a further 5 or so minutes until spinach is wilted. Yum! I love the idea of using a pita/gluten free wrap as your crust. Homemade pizza with different 'fancy pants' ingredients are awesome! It's much quicker than whipping up a pizza dough, that's for sure! I also love how it's all about the topping. That caprese pizza looks AMAZING! I love fresh basil with tomato and mozz, can't wait to get my basil plant going again (I accidentally killed it last week.... oops :) Yum to all those recipes!! Basil, tomato and cheese are a match made in heaven. Those Italians were on to something! I killed my basil last summer, too, and haven't gotten around to planting more :( Having a herb garden makes me ridiculously happy!